SONC offers three types of basketball competition: individual skills, 3-on-3 team, and 5-on-5 team. Individual skills competition allows Special Olympics athletes to develop sports skills in a competitive format designed as a stepping stone for athletes to team competition. The indvidual skills offered for basketball are passing, dribbling, and shooting. 3-on-3 basketball team competition is played on a half-court with three players a side (six player on a roster maximum). Games are played with two ten-minute halves with a running clock. The winner is determined by who has the most points at the end of full time, or the first team to 20 points. 5-on-5 basketball team competition is played on a regulation basketball court and follows North Carolina High School Athletic Association (NCHSAA) rules, with some modifications. Games are played by four eight-minute quarters with a running clock. The winner is determined by the team with the most points at the end of full time. Local program coordinators should submit entries along with the remainder of the Fall Tournament registration. Click here for a full list of Fall Tournament registration forms. These forms will be available closer to the event date. For coaches’ use only – do NOT submit with event registration. SONC Fall Tournament will be held November 9-11, 2018 in Charlotte. At that time, skills competition and 3-on-3 team competition will occur; 3-on-3 will alternate with 5-on-5 and be offered in 2019. Skills competition will be offered every year at the state level. Athletes and partners also have the opportunity and are encouraged to participate in various local invitationals. Check the basketball sport calendar for upcoming invitationals being hosted by local programs. If you are interested in hosting an invitation please contact the sports department at sports@sonc.net. Unified Sports Recreation Basketball is occurring at college campuses around the state. NC State, UNC Wilmington, Methodist University and Winston-Salem State University have programs currently underway. For more information on Unified Sports basketball, check out this video from SOI and ESPN. Cumberland County will be hosting a 5-on-5 basketball invitational on Saturday, January 26, 2019 at Cape Fear High School, 4762 Clinton Rd, Fayetteville, NC 28312. Due to limited space Cumberland County will be contacting programs directly with invitations to participate. Forsyth County will host a 3-on-3 and 5-on-5 basketball invitational on Saturday, March 2, 2019 at East Forsyth High School, 2500 W. Mountain St, Kernersville, NC 27284. This is a yearly event to honor one of Special Olympics Forsyth County’s outstanding volunteer, who passed away in a car accident a couple of years ago. Lunch will be provided to participating athletes and coaches. Awards will be presented following the conclusion of competition. Space is limited. Registration is due to Carlie Pudney by February 18th. Individual Skills Competition will be held from 3:00 – 4:30 pm. The location is TBD. Dinner and Dance will be held at the Chape Hill High School Gym and Cafeteria from 5:00 – 8:00 pm. 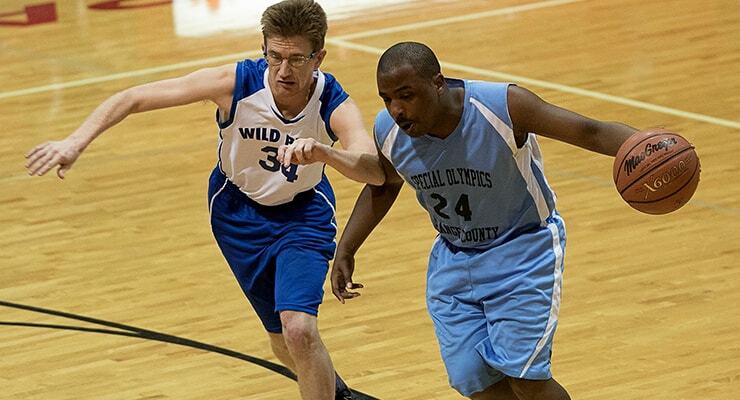 About Basketball: As a dominant sport in the Tar Heel State, it should come as no surprise that basketball is also a mainstay in the Special Olympics North Carolina program. Players take up basketball at all ages and at all abilities, from young players learning to handle the ball and keep it under control while dribbling to older, more experienced players who have the moves and know the strategies to play challenging ball. Differences of Special Olympics Basketball: Special Olympics Basketball offers a series of adaptations of FIBA rules that are optional when conducting team competitions. Some of these adaptations include adjusting the length of the game, allowing a player to take two steps beyond what is ruled by FIBA as traveling, allowing the free throw shooter 10 seconds to release the ball, enforcing a rule that allows only five seconds of closely guarded play in frontcourt, and rewarding two free throws beginning with the seventh team foul in each half. History: Basketball implemented its own state-level tournament in 1982. 1991 was a busy year for Special Olympics North Carolina basketball. Ken Bryant, a Basketball Development Team member was selected to be an official for the 1991 International Summer Special Olympics Games in Minneapolis, MN. 1991 was also the year that the program director Patton McDowell chaired the International Summer Special Olympics Games Men’s Basketball Tournament screening committee in Minneapolis. Ninety-five local programs currently compete in basketball in North Carolina.